Antonio Ramblés’ work reflects his heart for those at the edge of mainstream society. His stories capture the lives of intimately drawn characters and lend human scale to themes of intolerance, inequality, corruption, and exploitation. The ordinary people who populate Ramblés’ stories are vital, engaging, and memorable. They express their thoughts and feelings as much through deeds as through words, but even their talk has the ring of authenticity. They struggle not just against social injustice, but against familial rivalries, abuse, and failed expectations that have consequences for succeeding generations. World events and popular culture are unnamed characters in most of Ramblés’ books, and his historical backdrops are exactingly authentic. The year is 2007. The U.S is in the sixth year of its war on terrorism and the Great Recession is on the near horizon. The Mexican government has just declared war on the drug cartels, and on its Pacific coast, the livelihood of simple fishermen is threatened by a hotel developer who has enlisted corrupt police and drug-running thugs to drive them from their beachfront anchorage. American radicals living in Mexico as fugitives since the ’70’s are drawn to the fishermen’s cause, but when growing public sympathy draws media limelight, they find themselves gambling that they’ve outlasted FBI pursuit. As the confrontation escalates and the Americans’ involvement deepens, they’re forced to reconcile memories of who they once were with the people they have become. And they must come to grips with America’s metamorphosis during their long exile. Buy The Mirasol Redemption – or preview it for free – here on Amazon. 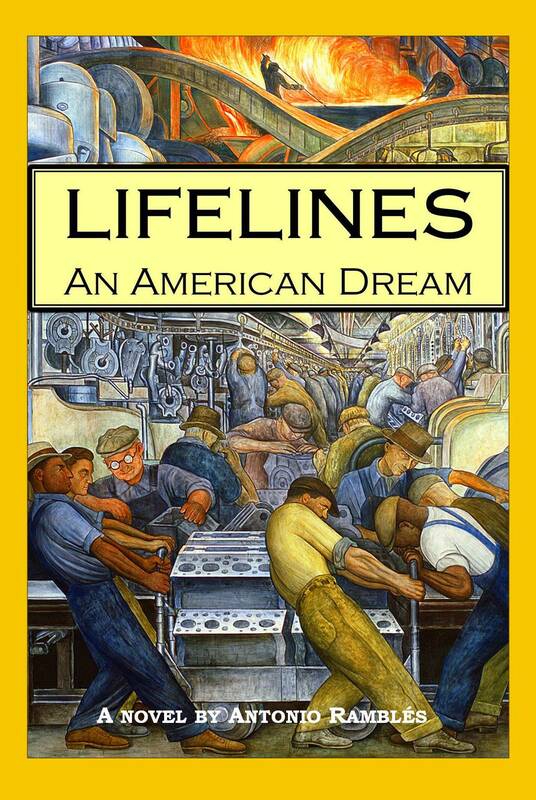 LIFELINES, Antonio’s second book and first novel, published in 2014, is the story of two families who have forsaken their past lives to pursue the American dream, and who come together in the melting pot of the industrial Midwest early in the twentieth century. Appalachian migrants and Italian immigrants with more in common than they know persevere through wars and economic hardship, dogged by personal tragedies that threaten to undo their American dreams. This novel is a collection of intimate snapshots that brings to life a history fast fading from collective memory. Rich in historical detail, it is set against the backdrop of America’s emergence as a world power in the twentieth century, and the rise and fall of organized labor. Lifelines explores the meaning of home and family, the credibility of fate, and the legacy of personal demons passed from generation to generation. Buy Lifelines – or preview it for free – here on Amazon.com. LAGUNA TALES, Antonio’s first book, was published in April, 2011. It’s a collection of serial short stories that draw on personal experience to capture the setting and lifestyle of the expat community in and around the mountain lakeside village of San Andrés. Six Americans from different walks of life arrive at personal crossroads that separately lead them to begin new lives along the shores of Mexico’s Lake Chapala. Buy Laguna Tales – or preview it for free – here on Amazon.com. Antonio is one of four writers who explore the lives of people at life’s crossroads in short stories set on four continents and spanning more than a century. His stories are populated by more of his signature displaced characters whom readers invariably embrace. And he has a knack for placing them in unanticipated circumstances with outcomes which plumb themes of prejudice and intolerance, fathers and sons, home, and family. These four authors’ distinctive voices lend an engaging variety of perspectives to shared themes. Buy Embracing The Fog – or preview it for free – here on Amazon.com. This literary collection of short stories and essays is full of insights by contemporary authors who write and live full time in Mexico or who have spent a lot of time living in the country. The collection contains works by twenty-two authors, Their writing spans a variety of topics; many contributions celebrate life in Mexico’s abundant sunlight while others examine what the shadows sometimes obscure. Buy Mexico: Sunlight & Shadows – or preview it for free – here on Amazon. Author Antonio Ramblés was born in Cleveland, Ohio. He has been a traveler to and within Mexico since 1975, and a Mexican resident since 2013. Hola, donde esta el estudio de Antonio y que estan exponiendo ahorita?